China's consumer price index, a major barometer for inflation, eased slightly to 6.2 percent in September after surging up to an 11-year monthly high of 6.5 percent in August, Zhu Zhixin, deputy director of the National Development and Reform Commission (NDRC), said on Thursday. The delegate to the ongoing 17th National Congress of the Communist Party of China ruled out the possibility of sweeping price hikes in the future, but predicted that the prices for farm produce which triggered CPI drastic rise and sparked inflation concern would continue to maintain at high level. Despite the slight drop in September, consumer prices still grew up 4.1 percent year-on-year over the first nine months compared with 3.9 percent from January to August. About 86 percent of the rise, or 3.5 percentage points, was generated by food price hikes, Zhu said. Refusing to disclose the GDP growth for the first three quarters which is yet to be released by the National Bureau of Statistics later this month, Zhu said it is too early to say China 's economy has turned overheated as the short supply of pork didn' t trigger "comprehensive, lasting and big price hikes". He predicted that the prices of grain crops will stabilize gradually as the summer grain crops harvest has surged 1.45 billion kilograms from the previous year to 115.35 billion kilograms this year while early rice output rose slightly to 31.95 billion kilograms. Currently, most of the country's industrial consumables remain in surplus. Latest figures from the NDRC revealed that the average price of pork in Chinese shops has dropped 11 percent from its peak in August after the central and local governments earmarked a total 14.6 billion yuan (1.9 billion U.S. dollars) this year to encourage farmers to raise pigs and boost pork supplies. But Zhu warned against blind optimism, saying that the possibilities of an overheated economy remain while preventing the excess growth of consumer prices should be taken as a major task of macro-economic control. 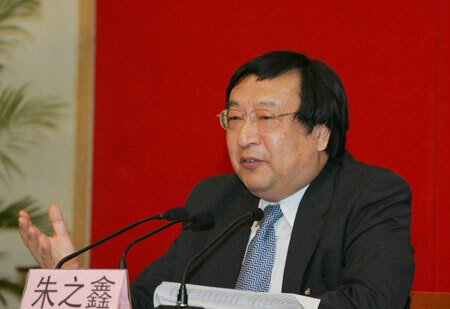 On the sidelines of the Party congress, Zhou Xiaochuan, president of the People's Bank of China, subordinated inflation prevention to employment expansion as the second priority of China 's macro-economic control and the recalibration of monetary policies. He said that the central bank would continue to adopt a prudent monetary policy to facilitate more coordinated economic development and support consumption expansion. Justin Yifu Lin, an economist with the Beijing University, said that the inflation in China remained low compared with the world's average as the core CPI excluding food and energy products went up only 0.8 percent year-on-year in the first nine months. "I am fully confident of the potential of China's economy. It's fully possible for China to maintain an annual GDP rise of nine percent in next 10 to 20 years," he said.